How’s your Christmas shopping going? If you’re in need of inspiration, I have some gift ideas for you. 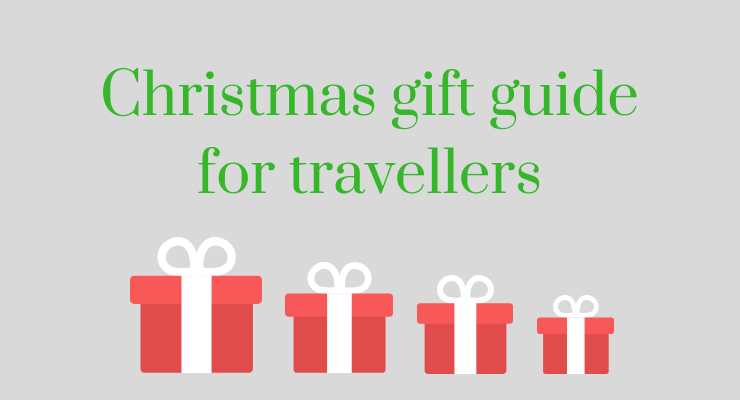 There are presents here for every kind of traveller, and all of them are things which I’ve bought for myself or for others, or which friends and family have recommended. Please note that none of these items have been sent to me by brands to review, nor am I being paid to share them here, (although some of the links below are affiliate links, which means that if you do click through and make a purchase, I may receive a tiny commission). The single most useful (but non-essential) thing which I take with me when I travel is some kind of scarf, poncho or sarong. I have different versions to choose from, depending on the type of trip and weather, and I find them useful as an extra layer of clothing for warmth or shade, as a pillow or a blanket, and to cover my whole head so that I can sleep on a flight. The ideal travel scarf needs to be light enough to squash into a bag, soft enough to use as a pillow and expansive enough to use as a blanket. Oh, and it also needs to be washable. If you enjoy reading, the best travel gadget has to be an ereader. Instead of using up half of my precious luggage allowance with reading material, I now load my Kindle with novels to read when I’m on holiday. My daughter also has a Kindle, and we use the devices’ sharing tools so that we can read each other’s books. Bluetooth headphones are brilliant because they’re wireless. This means, obviously, that you can listen to music, a podcast or watch a video without any cords getting in the way. Also, they work with any phone or device which is Bluetooth enabled, so you don’t need to worry about having the right connector. We’ve found the Sony ones to be very good. I bought my daughter a brilliant travel pillow this year, and now we all want one. It has a removable cover and it also has a hood, which I think is genius. She definitely managed to get the most sleep on our flight to Bangkok, thanks to this travel pillow. These days a portable charger is a must when you’re travelling, because the last thing you want is for your phone battery to run out when you’re away. In my family we each have our own portable charger. I think that mine is the best (so does my 15 year old – he keeps borrowing it): it’s a Cobra JumPack Power Pack and it’s powerful enough for three full charges of my iPhone. It can also be used to jump start a car, and comes with leads to do this. If you want to have your hands free when you’re travelling (advisable if you’re with young children) a backpack is the way to go. Mi-Pac backpacks are durable and well-designed, and have a padded laptop compartment inside. The backpack capacity is 17 litres, so it’s possibly not quite big enough if you’re travelling with just hand luggage. We have two EastPak suitcases, and I’m very impressed with them. EastPak suitcases come in a range of sizes, they’re lightweight and durable, and they open up into two separate zipped sections, which really helps to organise your stuff when you’re travelling. Travel games are great for anyone with school age children or teenagers, and for multigenerational and group holidays. When we go on family holidays we always take games with us. We usually play them in the evenings after dinner, or sometimes during the day when it’s hot and we need to spend some time in the shade. We also play these kind of games when we get together at Christmas with our extended family. Our current favourites are Bananagrams, Monopoly Deal, Uno and Dobble. Bananagrams is an engaging and frenetic word game for two to eight players – if there’s a large group of people you can divide into teams to play. For five years to adult. UNO is a strategic card game where you compete to be the first to be left with just one card of your original seven. For two to 10 players, seven years to adult. Dobble is a fun pattern recognition card game which is harder than it looks, and always seems to result in hilarity at our extended family gatherings. For two to eight players, six years to adult. Monopoly Deal is a faster and more fun version of the board game. It’s about collecting money and property and stealing from your opponents, and it can get very competitive. For two to five players, eight years to adult. Very nice and informative! Thanks for sharing this.